Dennis Eckersley is one of only a handful of pitchers to successfully transition from a starting role to a closer. He is one of only two pitchers in MLB history to record 20 wins and 50 saves in separate seasons. As a result Dennis Eckersley cards are well appreciated in the hobby. Being inducted into the Hall of Fame doesn't hurt either. Denis Eckersley has two rookie cards, 1976 O-Pee-Chee and 1976 Topps. He also appears on the ERA League Leaders card in each set. 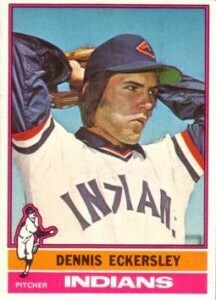 Additionally, Eckersley has four other cards that were released in 1976. However, due to their distribution methods of not being included in a base set, they are not considered true rookie cards. However, that hasn't kept them from being very popular with collectors. 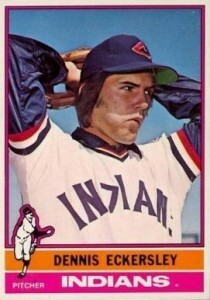 They include 1976 Hostess, 1976 Kellogg's, 1976 SSPC and an Indians team-issued card. Eckersley's first autographed card was issued in 1993 Fleer Ultra. Despite not being serial numbered, it has a disclosed print run of 2,000. His first memorabilia card was produced in 2001 Topps American Pie. Interestingly enough, the Rookie Reprint Relic card features a piece of an Eckersley game-used bat. This is traditionally not the type of memorabilia one would associate with a pitcher. Dennis Eckersley has maintained a career in the public spotlight as an analyst for TBS during the postseason. Far from forgotten, his autographed memorabilia is still in demand. He occasionally participates in larger sports collectible conventions. He is also said to be a willing in-person signer. 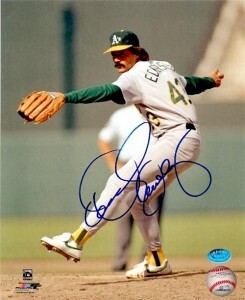 Eckersley is one of the only notable rookies in the set. The color intensity of this card, and others in the set as well, can vary greatly. It is a factor when being professionally graded. It can impact the surface grade significantly. The only noticeable difference between this card and the O-Pee Chee version is that it does not contain a bilingual back. The text on the back of the OPC card is written in French and English. The same color issues apply to this card as they do on the O-Pee-Chee Dennis Eckersley rookie card. 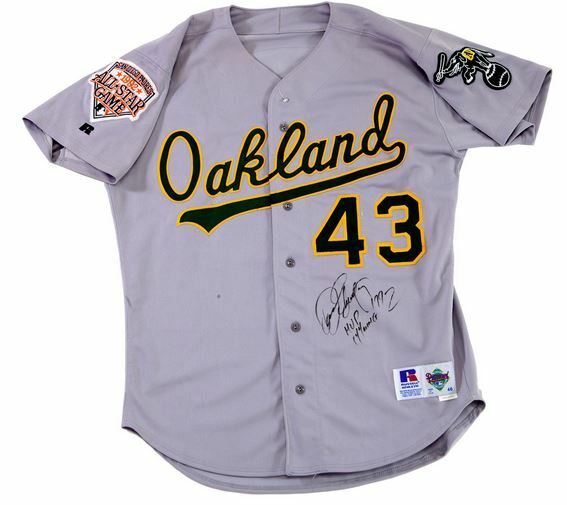 Below you will find an example of what Dennis Eckersley's authentic signature looks like. This can be used as a first point of reference for determining the legitimacy of autograph memorabilia, but is not a substitute for having your items authenticated by a well-respected professional autograph authentication company. Some of the trusted sources within the sports memorabilia market include the following companies: PSA, JSA, Steiner, Mounted Memories and Tristar. Click on any of the images below to view full size photos. It is a very difficult autograph to discern on a letter-by-letter basis. The "D" is discernible due to its over-sized nature. It overlaps the "E," which appears in the center portion of the autograph. The letters "l" and "y" are detectable by their wide loops. I’m wondering if you could help.me find a complete list of Dennis Eckersley cards ever made. I’ve been collecting his cards for years, but I keep finding more cards and variants of those cards. Please help! Thank you!